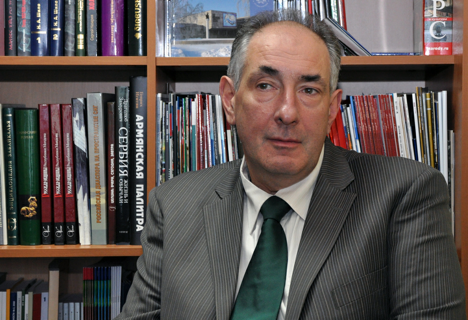 The BRICS need to play a role in mitigating negative effects of the Western sanctions, Russian diplomat Georgy Toloraya says. Collective protection by the BRICS countries (Brazil, Russia, India, China, South Africa) of their economic and political interests has come to the forefront, said Georgy Toloraya, diplomat and executive director of the National Committee on BRICS Research. "The more problems (we face - RIR) in the economy, the more reason to cooperate in order to protect one’s own interests. Western sanctions cannot be overcome by purely economic measures, and the BRICS need to play a role in mitigating their negative effects. <...> The current crisis must be used to uncover new opportunities for development,” said Mr. Toloraya at a press conference in MIA “Rossiya Segodnya” on Monday. “Economics was the reason for the coming together of the BRICS countries, but we should not think that the BRICS countries can work together only when their economies are on the rise. As the BRICS countries develop, the political component is increasingly coming to the forefront,” said the expert. On April 1, Russia will take over the presidency in the BRICS Business Council. The declaration on its establishment was signed at the fifth summit of the organization, which was held in late March 2013 in Durban. The purpose of the Business Council is to hold discussions on strengthening and promoting economic, trade, business, and investment ties between the business communities of the five BRICS countries. The next BRICS Summit will be held this summer in Ufa (Russia). In the coming year, Moscow will take over the presidency of this group. “At the summit that will be held in June this year in Ufa, Russia will put forward a number of proposals for 2015-2016, including the idea of ​​establishing the BRICS Energy Union, information cooperation, a trading platform and corporate regulations for cooperation between member states of the group,” said Mr. Toloraya. “At the summit, participants will discuss rules of conduct in the global information space, which are based on the principles of respect for state sovereignty and non-interference in the internal affairs of states. First of all, the member states will avoid criticism and propaganda directed against each other, and work together to attract to the BRICS organization, other countries that are not members, with equal voting rights and the opportunity to develop their economies without any sanctions or restrictions from the side of this Union,” explained Victoria Panova, senior advisor for strategic planning for the National Committee on BRICS Research, assistant professor of international relations and foreign policy of Russia at the Moscow State University of Foreign Affairs of the Ministry of Foreign Affairs of the Russian Federation.